Enjoy the ever-changing tapestry of history and modern-day culture as you hop from island to island, each more beautiful than the last. 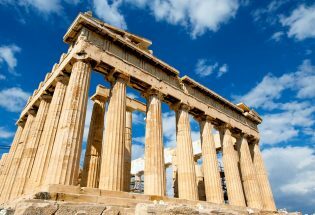 See Greece’s most famed sites, like the Parthenon, the Acropolis and ruins that allow the mind to view a glimpse of ancient times. Travel to famed islands of Greece with their white washed buildings and blue roofs. Pristine white sand beaches should not be forgotten either. Greece is a stunning country with an incredible history that ties in to much of the development of the current western world. The country is also a must visit for Greek food enthusiasts like ourselves. 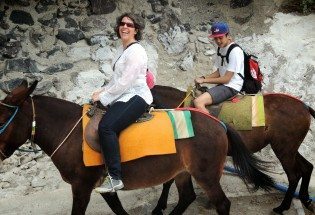 Student trip itineraries are completely customizable for your group, desires, and needs. Depart for Greece on an overnight flight. Climb the Acropolis to view the majestic Parthenon, considered by many to be the world’s greatest architectural feat. We will visit the Temple of Athena Nike, which once housed a gold statue of the goddess. See the Presidential Guard, pass the stadium where the first modern Olympics were held in 1896, and visit lively Omonia and Syntagma squares. 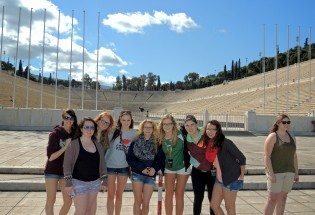 Walking tour of Athens: including Hadrian’s Arch, the Temple of Olympian Zeus, and more. 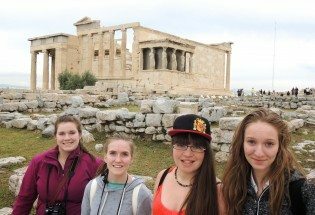 Learn about Greece through a workshop in Greek Art, a traditional cooking class, or a sport activity. Evolve led fun evening activity. Visit the Palamedi Fortress which is regarded as a masterpiece of military architecture. At the top we will enjoy impressive views of the Akronafplia, the old town and we can take the 999 steps back down to the bottom of the hill. Then we will walk to Karathona beach for swimming and relaxation. Explore Old Town today, See the elegant Venetian houses, neoclassical mansions and interesting museums that line the narrow streets. Visit the National Gallery and the Alexandros Soutzos Museum, an arm of the Athens National Gallery. Return to Athens in the evening for a live music performance. Take a ferry to the Island of Santorini, with lots of outdoor deck space to move about and enjoy the views. Explore the town as we enjoy our one-night stay in Santorini. Crete is the largest of the Greek islands and the fifth largest island in the Mediterranean. Our first stop will be to Ancient Knossos, the capital city of the Minoan civilization with the Minoan Palace, the home of King Minos, where legend says Theseus slew the Minotaur, half man, half bull, in the labyrinth. Be treated one of the most beautiful beaches in Crete today. The beach landscape is tremendous and the water for swimming is crystal clear and refreshing. In the late afternoon, we will travel back to the town of Chania and then take a high speed ferry back to Athens. Arrive in Athens. Venture to the most southern point of Central Greece as we visit the Temple of Poseidon, the Sea Gods’ temple atop the hills of Cape Sounion. Tour through the tall pillars and the marble slabs left behind from this Temple built around 450 BC. Enjoy a final banquet dinner as a group. Begin our travels back home after an amazing trip to Greece! Breakfast, lunch, and dinner included daily in Greece. Meals at locally owned and run restaurants and accommodations serving authentic cuisine sufficient for teenage appetites. Voting is required by law for every Greek citizen 18 years or older. Considered by many to be the world’s greatest architectural feat. Once housed a gold statue of the goddess. Her wings were clipped to keep her from ever deserting the city. We will see the Presidential Guard, pass the stadium where the first modern Olympics were held in 1896, and visit lively Omonia and Syntagma squares. Construction began on the temple in 515 B.C. Get ready to climb a few (hundred) stairs for the incredible view. Time to swim and relax. One of Greece’s prettiest and most romantic towns. White towns sit atop the rocky cliffs highlighted by black, brown, pink and green colors. Landscape of towering mountains, deep gorges, straddling the Cretan and Libyan seas where Europe, Asia and Africa meet. The capital city of the Minoan Civilization with the Minoan Palace, the home of King Minos. The beach landscape is tremendous and the water for swimming is crystal clear and refreshing. Spend an afternoon exploring Chania. Visit the Temple of Poseidon, the Sea Gods’ temple atop the hills of Cape Sounion.